Tributes have been paid to Gorden Kaye, the Yorkshire-born actor who became a household name through long-running BBC sitcom 'Allo 'Allo! Kaye, who played cafe owner Rene Artois in the hit show, died yesterday at the age of 75. 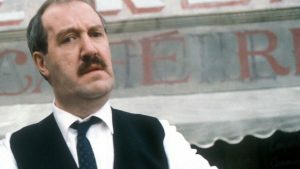 Gorden Kaye starred in all 85 episodes of 'Allo 'Allo! 'Allo 'Allo centred on the fictional exploits of resistance fighters in World War Two in German-occupied France. Kaye appeared in all 85 episodes of the sitcom, which ran from 1982 to 1992. Vicki Michelle, who co-starred opposite Kaye as waitress Yvette, praised him as a "brilliantly talented actor, consummate professional, loved the world over". Born in Huddersfield, Kaye got his first break in Coronation Street, playing Elsie Tanner's nephew Bernard Butler, and went on to appear in a number of roles in sitcoms including Till Death Us Do Part, It Ain't Half Hot Mum and Are You Being Served? before landing the role of Rene. Kaye's career almost came to an abrupt end in 1990 when he was critically injured by a falling advertising board in the Burns' Day storm. "Gorden Kaye was a terrific comic actor whose signature role, Rene Artois, earned his place in the comedy hall of fame," Shane Allen, controller of BBC comedy commissioning said. "He was instrumental in making 'Allo 'Allo! such a long running and well-loved series. His work lives on and thoughts are with friends and loved ones at this sad time."